In Stock / 563 SOLD - Order Now! It Works ThermoFight X is now the World's #1 Best Selling Fat Burner! Loyal Customer Special Offer - Save 40% - Pay ONLY $36 Per Bottle - Get Priority Shipping (Details below). Loyal Customer orders are PRIORITIZED click here to order. HOT ITEM! Orders are proceeded with It Works! You will get a separate email from It Works with tracking information. This is a product so powerful, don't be surprised if people think you had weight loss surgery. Real and authentic It Works ThermoFight X product shipped directly from It Works! and WE PAY THE SHIPPING and TAXES ( tax paid in most states) US Orders when you order from us so YOU SAVE MORE! 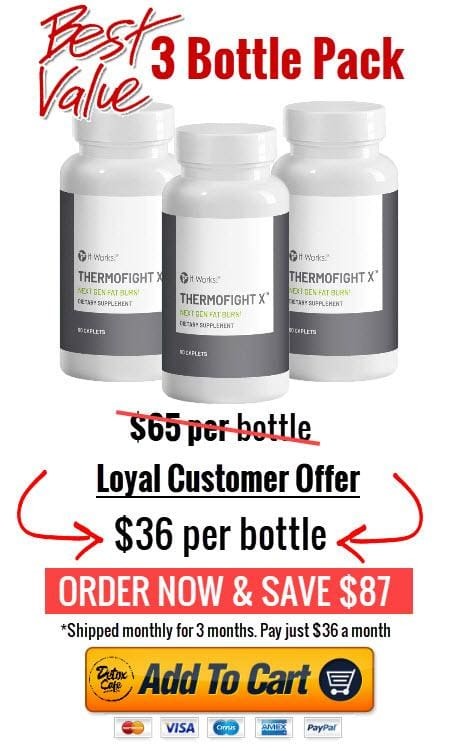 It Works ThermoFight X contains *Greenselect® Phytosome which drives nearly 2.5x more weight loss (on average 31 pounds) when combined with a reduced-calorie diet, compared to only an average of 11 pounds lost in the reduced-calorie diet control group. Weight loss regime should include both exercise and a reduced-calorie diet. What is It Works ThermoFight X? Why should I take It Works ThermoFight X? Why is It Works ThermoFight X noted as a next-generation fat burner? It Works! ThermoFight X achieves more than just boosting metabolism, that’s why! This product boasts cutting-edge ingredients with proven fat burning results - such as nearly 2.5X more weight loss with Greenselect® Phytosome when combined with a reduced-calorie diet, compared to diet alone. *† Additionally, It Works! ThermoFight X helps your body produce ketones more rapidly so you can achieve ketosis faster.† Getting to ketosis means you’re burning even more fat to fuel your body and mind! As a bonus, It Works! ThermoFight X also may help to balance your blood sugar and reduce sugar cravings.† Now that’s a next-gen product! 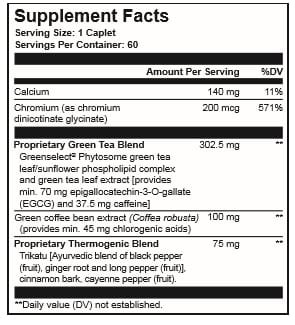 What are the exciting active ingredients in It Works ThermoFight X? Thermogenesis is the natural metabolic process your body uses to burn stored calories, a.k.a. fat! Specialized fat cells convert the stored fat around the body and release it as heat. Powering up your thermogenic rate can boost your fat metabolism (or calorie burn) and aid in weight loss - this helps to burn more stored energy from the fat cells in your body! Can I use It Works ThermoFight X if I am on a ketogenic diet? How many It Works ThermoFight X caplets should I take each day? It is recommended that you take one caplet in the morning and a second caplet in the afternoon each day, with food. Since It Works! ThermoFight X can also energize your body, we do not recommend taking your second caplet within four hours of your bedtime. How many It Works ThermoFight X caplets come in a bottle? Our new formula contains even more - each bottle contains a full month’s supply of 60 caplets! Is It Works ThermoFight X vegan? Yes, It Works! ThermoFight X is vegan. It’s also soy-free and non-GMO. Can I use It Works ThermoFight X if I am pregnant, nursing, or have ongoing medical conditions? Before using any new product, we suggest that you consult your physician to find out if it is right for you. Can I give It Works ThermoFight X to my children? It Works! ThermoFight X is recommended only for adults, ages 18 years and older. Take 1 caplet 2 times daily with meals. Drink at least 8 glasses of water daily. Not recommended for those sensitive to caffeine. Keep out of reach of children. Consult your physician if you are pregnant, nursing, taking medications, or have a medical condition. Protect from heat, light, and moisture. Store at 15-30°C (59-86°F). Do not use if seal is broken or missing. Pour quand au Canada ??? I'm interested in the thermofight x. Will I have to sign up or become a member of Itworks! to receive this product? I just want the product. Do you work out as you take this supplement? You sure can. It’s a fat burner and you can use it before you hit the gym. I TAKE 100 MG LOSARTAN FOR BLOOD PRESSURE . WILL I BE ABLE TO TAKE THE THERMFIGHT X ? That’s a Great question! However l, I must ask you to defer to your doctor before taking a dietary supplement. We don't recommend dietary supplements for nursing moms without discussing with your doctor. Here is the footnote below. †These statements have not been evaluated by the Food and Drug Administration. This product is not intended to diagnose, treat, cure or prevent any disease. Hi Jim. Thank you for your question.Yes ThermoFight X is gluten free. Great question! My husband is on HBP meds and he has no issus with fat burners. I would sugget to speak to your doctor or try a lesser dosage to see how it effects you. The recommened dosage is 2 per day. Are you able to take these with daily vitamins? Like probiotics, magnesium?